Life mission: To preach the Full Gospel for renewing the global church, discipling the nations, and healing creation. I am an American who has lived abroad as a missionary in Southeast Asia and Africa since 1989. 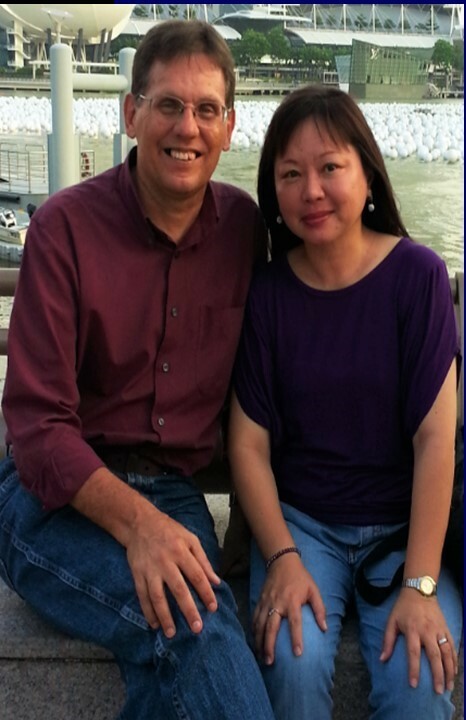 I have mostly lived in Singapore where I am based with my Singaporean wife, Jee Fong. I have served in numerous roles within churches and Bible colleges as a pastor, church planting director, and theological educator. I have ministered within some 15 nations in Southeast Asia and Africa. Presently, I engage an active itinerant preaching ministry. I have also become recognised as an independent scholar in Pentecostal theology. On Facebook, I co-administer the 8,000 plus member group, Pentecostal Theology Worldwide. Since 2012, I have been a member of the Society for Pentecostal Studies. In 2006, I received a strong conviction that I am called to represent the Pentecostal tradition. This conviction still burns strong. It evokes in me a sense of mission, passion, and vision. Let me share this with you. To preach the Full Gospel for all creation, fostering pentecostal spirituality and its theological tradition worldwide— for the unifying renewal of the global Church. In ecumenical service for the unifying renewal of the Church worldwide and the greater glory of God. Given this mission, passion, and vision, I identify myself as an ecumenical Pentecostal. As such, I envision Pentecostalism as an ecumenically aimed tradition and spirituality. For me, this means three things. To begin, I believe God has called me to represent this tradition. Hence, to minister the Gospel, out of the historical and theological resources that define this tradition. Second, this is a tradition God has entrusted me with. It is a “deposit” that shapes my reading of the Gospel (Jesus as Saviour / Sanctifier, Spirit Baptiser, Healer, Coming King), and how I am obliged to preach and minster the Gospel. Third, I believe that discharging this trust, must be also in ecumenical service to the greater global Church. This means two things. First, I recognise all church traditions as gifted with unique gifts of the Holy Spirit. I believe that God desires us to acknowledge that these gifts reside within our diverse traditions, and through the Spirit of fellowship, share them with one another. We do so for the global and unifying renewal of the one, holy, catholic, apostolic Church. Second, within these ecumenical aims of all Christian traditions, I recognise Pentecostalism as also, an ecumenically aimed tradition— communally gifted for the renewing for the renewing of all Christian traditions. And not only for the renewing all traditions, but for the renewing of all creation, within the saving aims of God. I believe I have a part to play in this great cause. I thus also believe that this should define and navigate the ongoing outcome of my life. Believing I have a part to play in this great cause, to it I have committed my life before God. Both my wife Jee Fong and I are thus ready to go wherever its labour may take us. Hence, that we may fulfill this mission for the good of the global Pentecostal tradition and the worldwide Church, the saving of all nations, the healing of creation, and the glory of God. I enjoy long walks with my wife, good coffee, and running. I get inspired by all things beautiful. I speak in tongues, make prayers, and write poetry. DISCLAIMER: What is said in this blog is mine and does not reflect the views of any organisation I am affiliated with. COPYRIGHT: This website and its content is copyright of Monte Lee Rice © https://monteleerice.wordpress.com/ 2010. All rights reserved. Any redistribution or reproduction of part or all of the contents in any form is prohibited other than the following: 1. You may only print or download to a local hard disk extracts for your personal, non-commercial, or academic use, provided you acknowledge this website (with the URL clearly shown) and me (Monte Lee Rice) as the author and source of this material. 2. You may copy the content to individual third parties for their personal use, provided you acknowledge this website (with the URL clearly shown) and me (Monte Lee Rice) as the author and source of this material. You may not, except with my express written permission, distribute or commercially exploit any content found on this website. Nor may you transmit it or store it in any other website or other form of electronic retrieval system.